Even though I don't have a 3-D printer...yet, I am really enjoying this tutorial. David is awesome, and I look forward to implementing what I learn. check out http://www.kraftwurx.com/ to print your files. They are good i have used them in the past. Thanks! Can they print working servos? no you still have to buy or build those. Sadly, 123d Beta 9 is no longer available for download. We apologize that Autodesk canceled the beta program of the software. It's too bad the software is no longer available. The video was great but this was to be my first try at a Cad program and I still need something to follow along with. 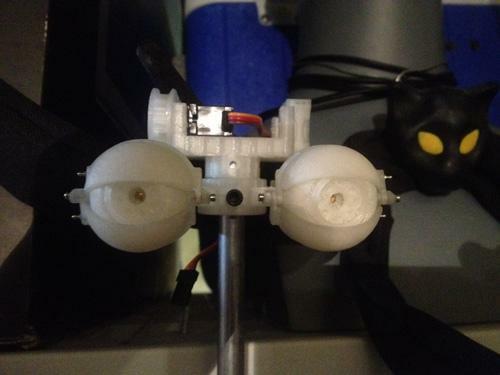 I was really looking forward to printing up some of the eye mechanisms to use in my props. As of now its free and it's almost identical to 123d beta but has lots of added features... Eventually they will start charging for it but as of now its free!!! Thanks for the update but it doesn't look like my system is supported as it requires 64 bit Windows 7. May be time for a new computer! I bought the tutorial and i'm trying to follow along with using Fusion 360. The program is pretty close to the one in the tutorial but I've run into a problem. I'm stuck in the beginning and not sure how to take off these lines that separate the eyeball. When I put the mouse over it, it acts as an individual piece instead of a whole. This is also my first time using any kind of 3D modeling software so I apologize if this seems like a silly question. Absolutely fantastic tutorial. I have been knee deep in Autodesk 123D Design trying out some of the tips you suggested. Copied over your servo model... Thanks. I have incorporated it into a test project. Really nice. Looking into Fusion360, as you recommended above. This technique offers an alternate path to the old school way of fabricating. I think it will fit well in my toolkit. Do you have a link or item number for the eyeball lens? I've checked All Electronics but can't find it. I've got the new computer up and running Fusion 360 and have the first component finished. Total noob here lookin to make his first eye mech. Question - I modeled a latex mask (WED clay to hydrocal plaster mold to latex) and I used bouncy balls as eyes that were 4 inches in circumference when making him in clay. I assume I should make my eyes match those measurements? Anyone know how that would adjust the measurements used in David's awesomesauce tutorial? Hi Ivan it is extremely difficult to back fit the eyes into the sculpture after it is already made. Lots of patience and sand paper will be required. to redesign the eye mech you should start with the measurements off the sculpt from center of the eye to center. You should also make the spacing in x,y,x adjustable by adding 1/4" 20 rods between each eye platform. Pretty much a back fit will not work without heavily modifying the design, you can however use the techniques he teaches to acquire a new design for the eye mech. Thanks for the reply. So when you say"...center of the eye to center." If humanoid do you mean center of eye to center of face, like the center of nose bridge? And then that would be the base eyeball size measurement? So far I have created the initial eye to be 13.17% bigger since that is the difference between his "average human eye measurement" and the bouncy ball size. So instead of using 1.125 as the base eyeball measurement, I went with 1.273. I planned on doing the same to the lid measurements - printing out the 2 balls with lids and seeing how they fit in mask. Do you foresee any issues with that approach? Anyone know how to copy paste components (like he does in the beginning of swashplate chapter) in autodesk fusion 360? Scratch that. figured it out. Ok - how about the e flite/heli max hardware? Seems like that ball link and piston arm are pretty specific to this build. Im trying to find them online. Has anyone found these anywhere? Although I am aware I may be speaking to myself, I realized there was a parts list listed in tutorial. Anyhow in the off chance somebody else reads this - I just got a majority my parts in and I noticed that either my ball links are too small or my pushrod o-ring end pieces are too big. I ordered what I think are the exact parts listed in materials. Pushrod: http://www.heliproz.com/EFLH2218-Servo-Pushrod-Set-BMCX/productinfo/142218/ BAll link: http://www.heliproz.com/HMXE8559-Flybar-Pivot-Assembly-Novus-CP/productinfo/HMXE8559/ Anyone happen to know which I should try to reorder elsewhere? I think I have seen larger ball links in a local hobby store, but I am worried the holes I made on eye lid would be too small? Any thoughts on how I should address? Thanks in advance! I order most of my linkages and hobby hardware from Tower Hobbies. Look around, things are often hidden among a large list of parts. I am working my way through this amazing tutorial. I designed in fusion 360 and printed on my Printrbot Simple Metal. I am very close, just waiting on a few more servos to arrive to complete construction. @David Covarrubias , I was hoping you could give some recommendations on alternative transmitters. It appears that at this point the Futaba 12Zap is discontinued. I was hoping to find something with similar features necessary for the eye mech like servo grouping/mixing. I am also hoping to keep the budget in the $200-500 range. Any advice would be much appreciated. Looking forward to getting into the Arduino class when it comes out, wish I could have been there for the live sessions. I've been using the JR X9303 for a few years, and really like it. It's not their latest model, so probably harder to find, but their latest equivalent model would be good. For future projects I'll probably make my own transmitters/receivers using Arduino and Xbee. That way I'm not limited to 9-14 channels like you find on most hobbyist transmitters. I had no problems finding all the parts and links etc on ebay from various hobby sources. After banging my head against the code for a few weeks. I finally asked for a bit of help with my adafruit servo hat and Voila! She's up and running. Thank you both. Here's a little test video. Awesome, glad you got everything up and running. Looks great! Did you go larger on the eye size or is that a wide angle lens effect? I'm digging the oversized cartoony feel!! !